At Healthy Bodies Physiotherapy, our team are expertly trained to assess, diagnose and treat musculoskeletal injuries. This commonly includes injuries to the back, neck, shoulder, elbow, hand, hip, knee, ankle and foot, as well as headaches and muscle and ligament strains. Our patients often present with problems originating from everyday ‘wear and tear’, accidents, including workplace and motor vehicle (TAC) accidents, postural issues and sports injuries including muscle strains and tendon injuries (tendinopathy). We work closely with a vast network of surgeons and provide physiotherapy to patients both pre and post surgery. Your physiotherapist will take a detailed history of your presenting complaint, perform a thorough physical assessment and provide you with an accurate diagnosis. During your assessment, we will identify the factors contributing to your condition and work with you to eliminate them and reduce your risk of re-injury. Our evidence-based approach to physiotherapy will not only address your immediate discomfort or pain but provide you with long-term solutions to presenting complaint. An Accredited Exercise Physiologist (AEP) is a recognised allied health professional who studies the safe exercise prescription and lifestyle modification to help those with, or at risk of, chronic disease. At Healthy Bodies Physiotherapy, we provide both 1:1 Exercise Physiology and supervised small group sessions. We design and deliver exercise interventions to suit the needs of each individual using a variety of modalities including gym, home and water based programs. Our approach Exercise Physiology will provide you with long-term health solutions that are sustainable and effective. At Healthy Bodies Physiotherapy we recognise that some patients require supervision with rehabilitation to more efficiently achieve their goals. Classes empower patients to address factors contributing to their condition and gain long-term control over their health and well-being. This is done by correcting posture and technique (E.g. Lifting, squatting, etc. ), improving strength, balance, co-ordination and mobility and develop the confidence to train independently. Our group classes are designed for versatility, so we tailor a customised plan for each participant in the class. 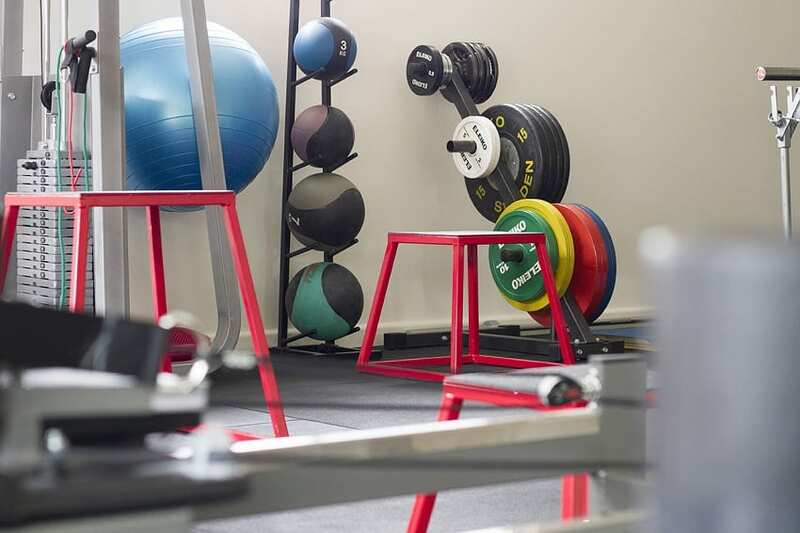 Our gym facility, features state of the art equipment including Pilates Reformers, Trapeze Table, Squat Rack, Weightlifting Platform, Bench Press, Barbells, Dumbbells (1-65kg), Exercise Balls and more, spans across a spacious 60 square metre area. Video analysis equipment can also be set up to record and play back instantly to promote faster learning of correct movement patterns. Having this fantastic gymnasium setup allows our clinicians to observe our patients’ exercise techniques (E.g. Bench Pressing or Squatting) first-hand so they can advise necessary modifications that will lead to a reduction in pain and a reduction in long term injury risk as well as implement our Small Group Rehabilitation Classes that are designed to help our patients to more efficiently achieve their goals. Group classes We offer a range of small group classes that are supervised by a physiotherapist or exercise physiologist including Supervised Rehabilitation, Clinical Pilates, Hydrotherapy, Diabetes Focus Group, Falls and Balance and Hydrotherapy. AND Exercise physiology involves safe exercise prescription and lifestyle modification to help those with, or at risk of, chronic disease including cardiovascular disease, diabetes, fibromyalgia and osteoarthritis. We serve clients from the following areas: Mentone, Collingwood, Dandenong, Cheltenham and surrounding areas. Book an appointment today!